A team from Unipart Logistics has raised over £15,000 for Bowel Cancer UK in an international cycle challenge. The Unipart Logistics London-Amsterdam Challenge involved cycling nearly 360 miles through four countries using many different routes, including roads, cobbles, cycle paths, and a tunnel. 2018 year marked the 10th anniversary of the annual Unipart Logistics Charity Challenge which, over the last ten years, has raised over £265,000 for charities, as well increasing awareness and giving Unipart employees access to vital information, advice and support services. This year’s challenge started in London in the early hours of 3rd October with the first challenge being to get out of London during the morning rush. The team then headed through Rochester and Canterbury and finally on to Folkestone to catch the Eurotunnel. 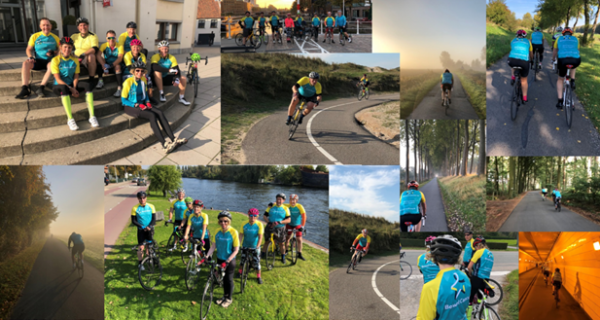 The team pushed on around the coast of Northern France towards Bruges via Dunkerque then through Belgium, into the Netherlands and on to Rotterdam, finally arriving in Amsterdam on day four of the challenge. This year’s charity chosen by Unipart Logistics was Bowel Cancer UK. Bowel cancer is very treatable but the earlier it is diagnosed, the easier it is to treat. People whose cancer is diagnosed at an early stage have a much higher chance of successful treatment than those whose cancer has become more advanced. The money raised will help continue vital research and campaigning.